Advantage The clause which gives the referee the power to wait before calling an observed foul thereby preserving an attacking play's momentum (and advantage). A foul should not be called if it would punish the attacking team more by awarding the restart. Assist The pass immediately before a goal is scored is credited as an assist. 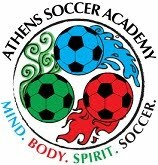 Athens Soccer Academy The Soccer Academy located in Athens Ohio and the home of How To Soccer. Attacking Space Passing or moving into a strategic space, typically behind the defense. Attacking the lead leg In a one-on-one situation with the defender sideways-on, the dribbler moves the ball into the opposite direction from the way the defender's hips are pointed. Attacking Third is the section of field--broken into three equal parts--nearest the opponent's goal. Attack the gap A pass or a run that splits defenders. Back post The furthest goalpost away from the ball. Balance Principle of Defense: a team concept implying good cover and using both width and depth. Ball in and out of Play (Law 9) The ball is out of play when it has wholly crossed the goal-line or touch-line, or when the referee has stopped the game. Ball played into touch See Law 9: the equivalent to ball that has left the field over the touchline. Ballside Closer to the goal you are defending than the ball when possessed by the opposition. BallTouch BallTouch or Touch refers to a player's ability to mesh with the ball. Good balltouch allows the player to dribble downfield while looking ahead and not down, for example. Ballwork Ballwork/Touchwork is a tool to build touch, control, confidencene and skill. Ballwork involves rolling the ball and using the various soccer specific surfaces of the feet. Behind The Defense Anything in that space closer to the goal than the defense. Be patient Patience is a key skill for a defender, as they should only commit (attempt to win the ball) when they have proper cover and when the ball is 'shown' to them. Cap When players play International Matches, they earn what is today called a cap, but what originated in England as actual caps given to players for such appearances. Captain The designated player to communicate with the Referee, and the player who represents the team from the coin toss to last touch. "Cauldron of Competition" UNC-Women's Coach Anson Dorrance coined this term. Check Run Variation of direction and pace to achieve separation from marking opponent. The Check run has the immediate change of direction and acceleration aspect that resembles a check mark. Chip Chip (v): to lift the ball in the air using the feet; to send a 'flighted' ball with the specific goal of having it land in a designated position (i.e. at the end of a teammates run). (n) a lofted ball. Concentration Principle of Defense: also called compactness and implies getting an adequate number of players behind the ball in a given area to deny space. Containing (the opponent, the attack) Staying between your opponent and the goal you are defending (goalside) or staying between the ball and the goal you are defending (Ballside). Cool Down Time spent after Training or competition to bring the heart rate down, refresh, and cool off. Cover Defender Starting with the next closest player ballside of the pressure defender, players behind the ball. Good positioning allows the cover defender to both a) challenge if the pressure defender is beaten, and b) break down the passing lane so to not get split. Cross a flighted ball from the flank. a ball served in from the wing typically in the air. Defending Third is the section of field--broken into three equal parts--nearest a teams own goal. Defensive Depth Principle of Defense: The strategic positioning of defenders to create layers and offer cover or support to the pressuring defender. Defensive Shape Shape refers to the spacing and angles the players are aligned in at any moment in the match. Defensive shape refers to compact numbers of defending players closer to their goal than their opponents and the ball and offering good angles of support. Delay Principle of Defense: Slowing down the attack to disrupt the attacking rhythm and to allow for more defenders to get behind the ball. Delay Immediate pressure, containment, and channeling: the first priority of defense. Depth Support Principle of Attack: Players on the flank offering good passing lane options. Diagonal System of Control Match Officiating System involving a center Referee--who runs on a "diagonal" and two Assistant Referee, who run outside the field, along the touchline and carry flags. DOGSO Denying an Obvious Goal Scoring Opportunity: Two types- by foul and by handling-- both result in send-off. Down the Line Parallel and along the touchline. Driven ball A ball struck with the laces, through the center, using the two pivot levers of the hip and the knee and typically following through on the kicking foot. Dynamic Stretching/Warmup Integrated Movement and Stretching aimed at increasing blood and oxygen flow and movement to soft tissue prior to activity. Extra Time/Allowance for Time Lost Law 7 of the Laws of the game instructs the referee to provide this allowance for substitutions, assessment of injury, removal of injured players, time wasting, any othe causes. SARTA Principle. Far Post Opposite of the near post. Alternative to back post. Finish a goal scoring technique in which you first look up, then see the keeper, then use finesse more than power to beat the keeper. Finishing To finish a ball is to score or shoot on goal using finesse rather than power. First touch A player's first critical touch after receiving the ball. Players learn to settle and prepare a shot off the first touch and to attack space behind the defender using the first touch. Flank The outside lanes of the soccer pitch. The area from where services happen and balls are played down the line. Flashpoint referee Flashpoint: is the moment in a game where the emotional content surges, and the tension level increases. Flats also called training shoes; soccer shoes without studs or "cleats"; shoes with little support built into the bottom so that the angle of presentation to the ground is similar to a soccer shoe during kicks. Flats are different from but sometimes substituted by tennis shoes, running shoes, or sneakers. Flick or flick-on header a bump from the underneath side of a ball in flight which pushes it on to a teammate. Follow-Through the motion of the leg continuing after the ball is gone. Force Defensive Tactic involving directing play using positioning tactics. Defenders force play away from the center line of the field and toward the touchline, ultimately the corner flag. Fouls & Misconduct See Law 12 in USSF Laws of the Game. Fourth Official See appendix in USSF Laws of the Game. Frame The frame is the goal. "Put the ball on frame". Franken-walk Dynamic Stretching in which the players act like Frankenstein's monster, walking with stiff arms and legs emphasizing range of motion to shoulder joints and hips. Game Tone/Match tone a metaphor to describe the tension level of a particular match, also called the temperature. Give-n-Go/ WallPass/ 1-2 Give and Go: an archetype play wherein two players combine such that A passes to B and moves into space behind opponent G, as B passes into that space. The rhythm is a quick 1-2. GoalFace The opening between the crossbars. Goalside Closer to the goal you are defending than your opponent. Handling Deliberate use of the hands by a player other than the goalkeeper. Hat Trick When a player scores three goals in a game supporters throw their hats onto the field before the restart. Hitting the Whistle Referee term for a whistle blast. Typically the intensity of the blast corresponds to the intensity of the appropriate sanction. Immediate Pressure After a team loses possession of the ball, the closest player to the attacking player with the ball who is goalside applies "pressure" by maintaining proximity to ball, feinting tacles, and forcing play to the sideline. Improvisation Using individual technique, skill, magic to change the game. Improvisation should be taken in relation to the amount of risk involved. Keeper/Goalkeeper Goalkeeper or "Keeper" is the last defender and the first attacker. Also called keep, netminder, goalie, etc. The goalkeeper is permitted the use of hands within their own penalty area. Kickaround Term heard in England; the equivalent of a pick-up game. The entire soccer community 6-60 year-olds all play on the same field in the same game. The kickaround serves the function of social soccer. It encourages vitality and community. Kickoff The start and restart of a soccer game. Kickwall A flat surface used to rebound the ball back to a single player or number of players. Kickwalls offer the lone player a return passer. Kickwalls can be combined with any size goal to create an intense goal area training environment. Laws of the Game United States Soccer Federation version of FIFA directives in the current year relating to the manual with the 17 Laws. Leading Pass Otherwise known as a ball into Space. A Leading Pass is directed in front of someone in motion. The pass is designed to meet the target. The Leading Pass can be one of timing where the desire is to intercept the trajectory of a running teammate, or it can be one of persuasion, that is, a pass made in to space (typically behind the defense) with the intent of 'suggesting' to a teammate where to run. Magic A moment in the game when a player or team exhibits the unexpected, the unbelievable, and the impossible. Match Minute Tracker Tool used by How To Soccer to provide point by point match analysis. Mental Image The construction of a mental image is important for a player to gain consistency in technique. The mental image is the ideal technical image with the intended result. For example, a penalty kick which is perfectly placed. Mobility Principle of Attack: Using off the ball runs to offer strategic support and to create space. Near Post The nearest goalpost to the ball and presumably the shooter. Negative Ball A pass backward toward a team's own goal. Nutmeg or "Meg" Formerly knows as the Ole', the nutmeg is accomplished by passing the ball between the opponents' legs and successfully retrieving it on the other side. While passing the opponent, the attacker yells out "Nutmeg!" or "Meg"! Offside When a player becomes involved in play from a position nearer to the opponents' goal than the second to last defender at the moment the ball is played forward by a teamate. Involved in active play means the player has interfered with play, interfered with an opponent, or gained an advantage by being in that position. Goal Kicks, Corner Kicks, and Throw Ins are exempt. Offside Position An attacker who is nearer to the opponent's goal line than both the second-to-last defender and the ball is said to be in offside position, provided he is not in his own half. Being in offside position itself is not an infraction. Onside Staying onside means at the moment the ball is played forward toward a goal from within that half the player who receives the pass had--at the moment the ball was played-- at least two defending players between him/her and the goal he/she is attacking. Opening your Hip to angle your hips so that they face the play squarely. Overcommitment To over-commit as a defender is to run past the ball or attempt a tackle in such a way as to render oneself out of the play. Overlap any time a player from a more defensive position moves up-field (closer to the opponents' goal) to pass a teammate--the overlap--in a more attacking position. The overlap can be with or without the ball. Passing Lanes The avenues between opponents along which they can pass to one another. Passive Defending Defending in a manner that allows the attack some manner of success. Passive defending can be when an older player such as an adult plays with a younger player such as a child, or when an attacker is trying to perfect a new technique or skill. Penalty/Penalty Kick/ Spot Kick A specific type of direct free kick from the penalty spot 12 yards from the goal line. At the taking of the penalty kick, only the goalkeeper and the shooter are allowed within the penalty area until the ball is played. Penetrating Pass A pass into the space behind the defense. Penetration means the ball passes opponents and gets behind them or closer to their goal than they are. Penetrating runs with the ball involve players dribbling past their opponents; whereas penetrating passes and shots are balls played past opponents or into goal. Penetration Principle of Attack: Using runs, passes, shots, etc. to split the defense and attack the space behind the defense. Player-Persona This refers to the psychological transformation of people into players when they step onto a soccer pitch. Point of Attack the position of the ball indicates the point of attack. Teams are encouraged to change the point of attack quickly in order to expose and exploit strategic spaces and "looks" at goal. Possession To have possession of the ball; ball possession. Possession Game A ball game in which teams try to gain and hold ball possession. Games in a small area such as 3V3, 4V1, and 5V2. Pre-Game Pre-game: preparations before a match by official, players, etc. For officials this involves discussing how to handle various scenarios. Pre-Hydrate To begin drinking water or hydrating days before a competition. Pressure Defender Closest defender to the ball, responsible for delay, jockey, channel or force. Principles of Play The foundation of core principles which leads to an understanding of the game across levels. Public Word (admonition) A referee technique aimed at player management. A scolding, public and brief. Recovery To move from a position behind the ball to a position closer to your goal than the ball when you team does not have possession. Recovery runs are back toward your own goal. Rhythm the pattern of sounds in the game. To be in syncopation with the ball with your team. To be in Sync. Serious Foul Play See USSF Law 12 playing in a manner unacceptable to the spirit of the game. Service To set a ball up in front of goal to be finished. To place the ball into a space where the attacker can score using a single touch. Set Piece a designed play. Set pieces occur from restarts such as corner kicks, throw ins, and free kicks in the attacking third. Shell/ Defensive Shell All or most players from a team staying near to their goal and behind the ball. Shell defenses can only hold for so long and need an effective outlet target player to relieve the pressure and provide attack. Shoe upper The part of the shoe that is not the sole. The leather or soft plastic part of the shoe that the player can see when the shoe is worn. Sideways-on a Defensive posture in which the side of the body faces the ball rather than the front. Such a posture allows the defender to be "half-turned" toward the defensive goal. Signature youth moves Signature youth moves are soccer tricks or fakes with the ball designed to unbalance your opponent to the direction you intend to go in. Small-Sided Play games of teams in small sides such as 1v1, 2v2, etc. Soccer Instruction Books Assist coaches at all levels. A few good resources, Coaching Soccer Successfully by Rees and van der Meer and The Soccer Coaching Bible, a compilation of articles by collegiate and professional level coaches. Space A key soccer term. Effectively it means all of the pockets of unoccupied space on a soccer pitch (field) during play. For a player to get "open" or get free of a mark, he/she must "create space". It is to extricate yourself from tight coverage. For the ball space is anywhere players are not. So a ball can be played across the field 'into space' for a teammate running forward from behind; a ball can be played forward through a gap in the defense or in the air, for a teamate to run on to. Spirit of the Game The notion that soccer is meant to be beautiful and social. The primary aim is to get along and enjoy all the talent on the field. Split Any time a ball passes through two opponents, the possessing team is said to have split them. Stay one's ground Staying one's ground means to keep oneself between the ball and the goal as a defender. It does not mean to stand still, but to move with the dribbling attacker, to shadow the attacker, and to apply pressure on the ball. Stess Load Simulated recreation of game speed conditions involving various devices. Stress Level The amount a player has to struggle to succeed. Developing players with resistance set just above their ability are encouraged to succeed. Strike To kick a ball using a finishing or driving technique. To get good contact. See driven ball. Studs up Usually in reference to an illegal sliding tackle in which the defender shows his cleats, or studs. Given the risk to endanger another player, the referee will typically stop play and deal with a studs up tackle. Super Skipping Dynamic Warmup exercise incorporating skipping with a single leg vertical leap for height. We call this Super Skipping because we act like Superman taking off to fly around Gotham. Support A player who does not have the ball wants to support the player with the ball by moving to an area where an open passing lane is available (i.e. moving into space). Good ball support allows the attacker to choose from options, and therefore the game is not predictable. Sweet spot the hardest part of the foot. at the top edge, just below where the shoelaces get tied. Switch On (to) Verb-- to switch on means to enter into the psychological space that competition at that level requires. System of Play The method or style a team uses to win games. System refers to team lineup shapes such as 4-4-2 (4 defenders, 4 midfielders, 2 attackers), or 3-4-3 , etc. Also a system can refer to the strategic method behind the style a team plays. Tackle A technique used to steal the ball. Tactics Using strategy in the way the game is played. Techniques The individual skills in the game such as the volley, the chip, etc. The Lanes The typical patterns players run to attack different parts of the field. In front of Goal, for instance, the lanes would be those curved paths starting out near the penalty area and tracing to each post and in front of the goal. Throw In (the) Also See Law 15 in USSF Laws of the Game--A method of returning ball into play after it has wholly crossed over the touchline. to "Show" (for the ball) Checking back and making yourself visible to the possessing player. Total commitment Players must accept the role of competitor and team player and have 100 percent enthusiasm for engaging in play. Touch/ Ball Touch Touch on the ball, refers to the sensitivity of a player's ball control. Touchline the line delineating the outside perimeter of the field and included as the field. Under 8/ U8 This is shorthand for a player who falls within the birthday requirements to play as an under 8 player. In the United States an Under 8 player should stay under 8 years of age until after August 1. Weight of a pass or a touch is the amount of power behind the ball. A weighted pass arrives in the space at the appropriate time. A weighted pass may also use spin to control the ball movement. Weighted Pass; Weighted Ball passer applies exactly the correct amount of speed and force to the pass to meet the run of the target player. Well-timed Run Typically starts behind the ball and arrives into space at the same time as the pass. A well timed run may begin parallel to the goalline in order for the attacker to stay in an on-side position. Width Principle of Attack: spreading to use all of the available space across the width of the field, and staggered to provide depth. "Winners!" The term "winners" is shouted by players and coaches as the ball is about to drop from the air into a crowd, such as on a punt. The term reminds the player to get a well-timed vertical leap and above all to be strong in the air. World Cup 64 nations final to a four year around the world tournament. See FIFA the world's governing body for the sport of soccer. Wring of Risk Divided into thirds, the field presents defensive,midfield, and attacking thirds. Passing out of the defensive third of the field is the first priority.